After years of constant turmoil, Kobe Brown, 18, says he's finally found some stability at Shaw House in Bangor. For youth who live in Penobscot and surrounding counties, the search for a safe place to stay often begins on the doorstep of Shaw House in Bangor. It is a shelter that serves up to 16 kids who are homeless or at-risk. Inside, draped across a couch, is Kobe Brown. He is 18-years-old. "I'm kind of in a tight situation because of past things that have happened in my life," Brown says. "I moved around a lot. Placement to placement — hospitals, group homes, foster homes." Brown was born in Boston but moved to Maine as a child. He says much of his youth was chaotic and abusive, which led state agencies to remove him from his home when he was young. His treatment by family made him angry and upset, he says, and he expressed his feelings through emotional outbursts and by getting into fights. "I have anger issues I'm still working on," he says. "I still have to work on them." Brown moved from town to town around rural York County, then to New Hampshire and Portland. Despite the constant turmoil, Brown says he found a community of close friends in southern Maine. But after another angry outburst at a shelter, he says he was asked to leave. That is how he wound up at Shaw House, where he has been living for the past few months. Brown says it was difficult to leave his friends in southern Maine. "I still cared for them. I worried about them. I didn't want to leave them there," he says. 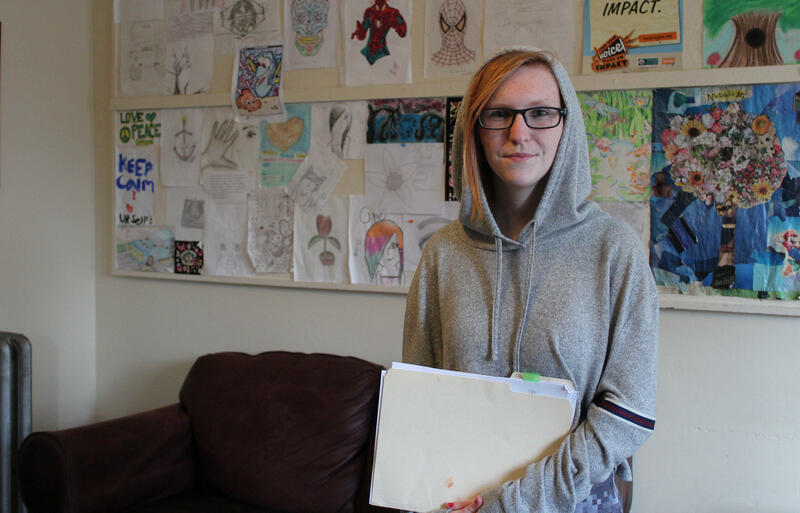 The decision to move can be necessary for some teens to get needed services, such as case management, counseling and shelter, which are already limited in many parts of the state. University of New England professor Thomas McLaughlin, who conducted a survey of homeless youth in rural Maine four years ago, says despite their circumstances, many don't want to leave their surroundings. "The community knew them. They knew the community," McLaughlin says. "There was a desire to make it work. So it might mean that they would couch surf, move around, work at different places. All of them seemed motivated to stay in the school. Motivated to stay connected to their community." "The trick is — and we still haven't figured it out — how do you serve a young person who's homeless in a rural community, without them coming to one of the urban centers?" says Chris Bicknell, the executive director of the New Beginnings youth shelter in Lewiston. "How do you provide safety and support for them where they are? So they don't have to leave their school. They don't have to leave their other natural supports. Their coach or their band teacher, whoever it is that's their natural support in that community. Whether it's their other close relatives. We haven't quite figured it out." "My anxiety, my depression, everything out as anger. I looked at the world as a hateful, hateful place. Once my friends started dying and stuff, I just thought the world was a hateful place," says Avory, who was moved around the state from Penobscot County to Portland. "I've always looked at the world as a hateful place until I came to New Beginnings." Funding challenges have exacerbated the problem. Rumford Group Homes, which runs emergency homeless shelters and provides transitional housing in Oxford County, used to offer a maternal group home program for pregnant and parenting youth. But executive director Melissa McEntee says the federal government didn't provide funding last year. She says while the organization tries to help kids stay in the region, it's now had to refer some teens to other parts of the state. "We're happy to refer and happy to link them to what they need," McEntee says. "But it's also a little bit distressing that we're telling them, 'OK, but if you do go there, it's going to be an hour away.' And that's difficult to tell kids sometimes." One new approach to addressing the needs of rural youth is being explored in southern Maine. It's called a "host home" program, in which volunteer families open their doors to teens until they can be connected to services and get back on their feet. Bicknell says one of the biggest challenges is finding the money to pay for staff to recruit host families and eventually move the kids into a more stable environment. "That has to be a mobile force who goes to whatever town needs that," he says. "That's expensive. That's three full-time staff people, all their travel time. And just the sheer footprint of the state, right? There are lots and lots of little towns that have potentially many young people that are struggling with housing crises." But for some teens, moving to a new area can be for the best. Brown says he's learning to manage his anger, and after years of moving around, he's finally settling down. "This is basically home," he says. "Not like, here. But it helps. Not sleeping on the street. Not out in the cold or rain. Actually getting some food and water. Sometimes it's depressing. But I like being here. Because I have friends who care about me." And Brown says he's getting support from Shaw House, and is even looking at going back to school. Our reporting on issues affecting teenagers and young adults in Maine is made possible with support from the John T. Gorman Foundation.